This walk: 2016-2-3. Two Bridges, buried tor, Littaford Tors, Longaford Tor, Crockern Tor, Muddilake Brook, Beardown Tors, Devonport Leat, Wistman's Wood, Crow Tor. Previous walks in this area: 3rd June 2009, 8th October 2009 and 4th Feb. 2015. Buried tor in the car park at Two bridges - this granite formation in the car park opposite the Two Bridges Hotel is said to illustrate how the tors of Dartmoor were formed. The rock is eroded underground. The hypothesis being that the rain-water was acidic, further enhanced by the soils, causing the erosion of weaknesses in the rock to form horizontal and vertical joints, leaving them filled with soft growan. The growan becomes removed in geological time as the nascent tor becomes exposed to the atmosphere by the erosion of the overlying soils. It is postulated that this occurred during a warmer, wetter climate such as in the Late Tertiary or in inter-glacial periods, with the acidity of the rain being enhanced by soil conditions. The opposing theory is that tors formed above ground following exposure to wind and rain. Source: Ken Ringwood, Dartmoor's Tor and Rocks, University of Plymouth Press, 2013, page 9. Looking north to the smaller Littaford Tors, SX 61620 76916, elevation 444 metres (1456 feet) and the larger Longaford Tor at SX 615 779, elevation 507 m (1663 ft). Crockern Tor was the site of the Dartmoor stannary parliament - Wikipedia: stannary parliaments for Devon and for Cornwall).
" King John granted a charter to the tin miners of Cornwall and Devon in 1201, confirming their just and ancient customs and liberties. The tin miners of both areas originally met together at Hingston Down and referred to themselves as a Parliament. Edward I's 1305 Stannary Charter established Tavistock, Ashburton and Chagford as Devon's stannary towns, with a monopoly on all tin mining in Devon, a right to representation in the Stannary Parliament and a right to the jurisdiction of the Stannary Courts. Plympton became the fourth Devon stannary town in 1307. The parliament consisted of ninety-six jurates, with twenty-four being chosen by each of the four Devon stannaries. The jurates were chosen at special courts held in each stannary by tinners: a term broad enough to include not just miners and tin work owners, but others concerned with the tin industry. The Parliament usually met in an open air forum at Crockern Tor. The last convocation of the Devon Parliament was in 1786, but as late as the 1980s, an honorary Stannator would be named whenever a new tin mine was opened." Walking north, parallel to the West Dart River, with a quite stron wind, with one good hail shower that brought us to a stop! Zoomed view of Crockern Tor: "There is evidence for ten assemblies at Crockern Tor: in 1494, 1510, 1532, 1533, 1552, 1567, 1574, 1600, 1688 and 1703" .....The last meeting for which records survive was on 23 September 1703 where the Warden, John Granville, 1st Baron Granville and the Vice-Warden, the Honourable Samuel Rolle, opened the court at 8 a.m. The last court was said to have been held in or around 1745, but no documentation exists, and considering that the tin industry on Dartmoor had by then declined greatly, it could have been only a small affair.". The head of the Muddilake Brook, approx. SX 6123 7579, that feeds into the Cherry Brook. It was not easy going today! Sheltering in the lee of a rock pile at Crockern Tor. Looking north up the West Dart valley, with part of Beardown Tors visible on the sky line (left of centre); Wistman's Wood is also visible: one of three relict oak woods on Dartmoor - the most northern one is Black-a-tor Copse (or Black Tor Beare, on the West Okement River, running into Meldon Reservoir), where the trees are not as tall as here; this one - Wistman's Wood; and Piles Copse beside the River Erme on south Dartmoor, where the trees are taller than in Wistman's Wood. These trees are apparently pedunculate oak, leading to the argument that sessile oak has replaced much of the pedunculate oak in the south-west (Source: The Broadleaved Woodland of Dartmoor. Above: The dark line below the lighter brown of the hill opposite is where the Devonport Leat runs. Here, it appears to run uphill although this is an illusion due to the form of the land. © Crown copyright and database rights 2016. Ordnance Survey Licence number 100047373. Use of this data is subject to terms and conditions. 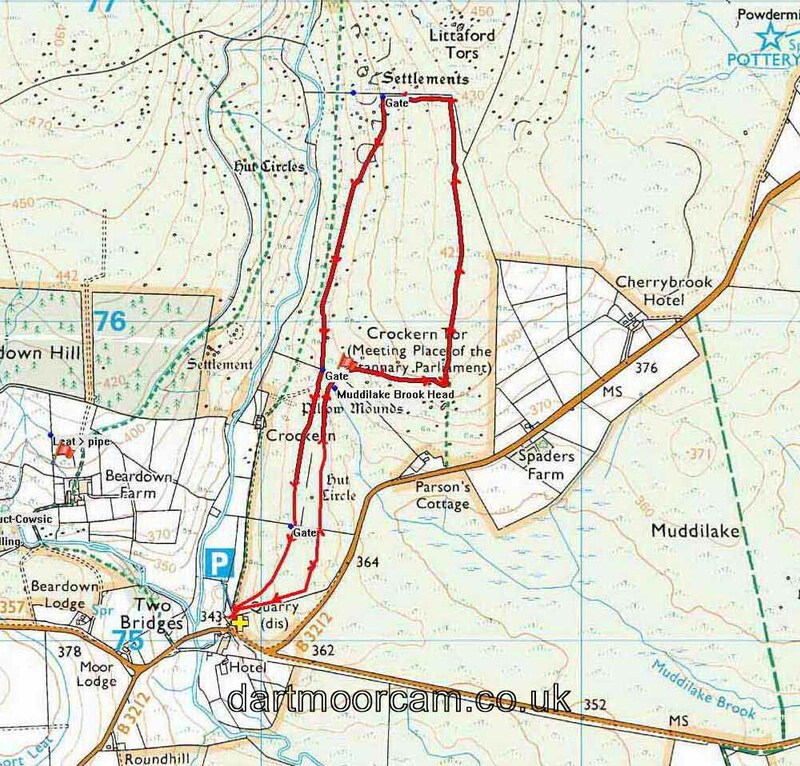 This walk was reached by following the B3212 from Princetown and parking in the quarry opposite the Two Bridges Hotel, at the yellow cross/Psymbol on the map. Distance - 4.44 km / 2.76 miles.